Headquartered in Austin, Texas, EdgeStar is the maker of a wide variety of different wine coolers, with capacities ranging from as little as 12 to as much as 332. They offer plenty of very attractive coolers with modern designs that look superb. If you’ve set your sights on EdgeStar for their superior value and huge selection, this top-four list will help you narrow down your choices to the one that’s right for you and your wine storing needs. Without further ado, here are the four best wine coolers made by Edgestar. At the top of our list is Edgestar’s 36-bottle dual zone cooler featuring a convenient and inviting French door design and large stainless steel handles. Each door has its own lock for added security. The doors use black dot matrix tempered glass. The cabinet is black trimmed with stainless steel. It has a rather industrial look, and appears to be of very high quality. The build quality is indeed great, as this cooler is built to last. It has 10 stainless steel trimmed wooden shelves and two more partial depth slide-out wooden shelves that are also trimmed in stainless steel. It utilizes a quiet compressor cooling system that balances the temperatures in each compartment very well. The interior features a blue LED light like most other Edgestar wine coolers. It vents from the bottom, so it’s perfect for under-the-counter installation. 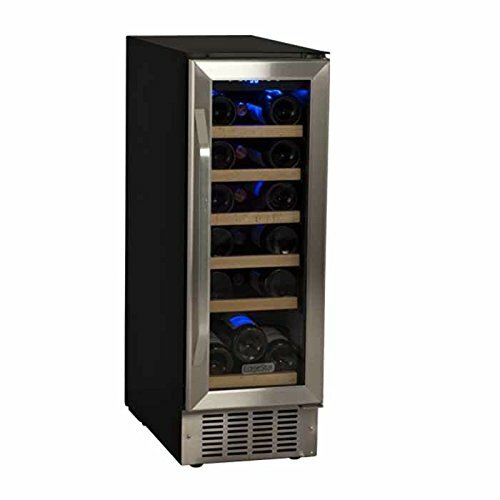 For its stylish look, quality build and dependability, this 36-bottle Edgestar is the ideal choice for someone looking for a wine cooler of this size. For a smaller sized cooler, Edgestar offers a very nice 18-bottle model that can be freestanding or built-in with ventilation located at the bottom. This single zone cooler has a reversible door with tempered black dot matrix glass. It’s very slim and can fit in tight spaces without needing to leave any area around it for it to breathe. The temperature inside the cooler is shown on a digital blue LED display. 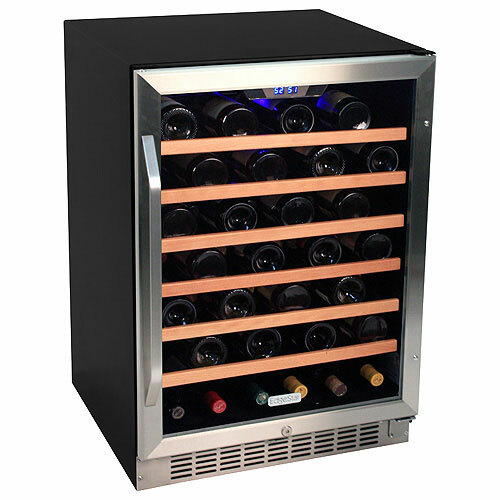 The 18-bottle EdgeStar wine cooler uses a relatively noiseless compressor cooling system. 18 standard 750ml bottles should fit just fine. Some bigger bottles may fit as well. 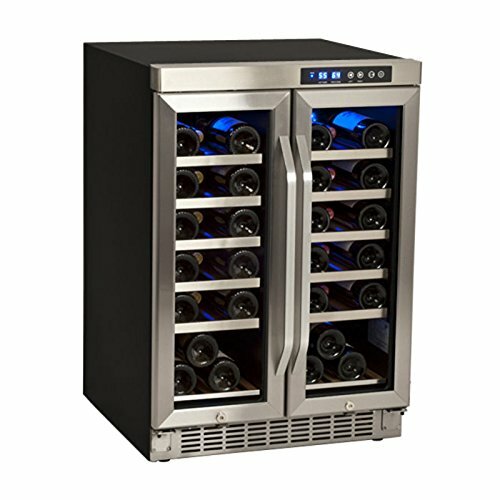 Its dimensions fit the space of an old trash compactor easily, so if your compactor is just taking up room, why not replace it with this fine wine cooler? You get all these features for around $520. For a much larger option, EdgeStar’s colossal 121-bottle single zone cooler has a lot to offer. Its 11 wood trimmed wire shelves slide completely out, letting you remove them from the cooler altogether. This will enable you to fit larger bottles than the standard sized wine bottles its intended for. It can be either freestanding or built-in, as it has ventilation from the bottom. The door uses tinted glass and is reversible. The 121-bottle EdgeStar has LED lighting on the interior, and a blue digital display on the exterior that displays the cooler’s inner temperature. The cooler is rubber brushed to help protect your wines from potentially harmful micro-vibrations that may be emitted from the compressor cooling system. There is also a dual zone version of this model: CWR1101DZ. 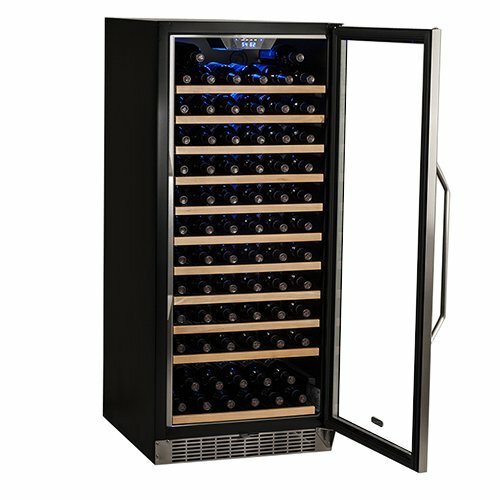 At around $1,100, this wine cooler offers high quality construction, very large capacity and a sleek, professional grade design. EdgeStar offers a quality, larger midrange option with a 53 bottle capacity (single zone) that looks and functions similarly than the first three on our top-four list. It has six wood trimmed wire shelves that fit standard 750ml bottles, but are completely removable in case you want to store oversized bottles as well. Its compressor cooling system has ventilation on the bottle. An internal fan circulates cold air evenly within the cooler. Its stainless steel trimmed door comes equipped with a security lock. The door is reversible and utilizes tempered double-paned glass to retain temperatures inside the cooler. There is also a dual zone version, CWR461DZ. For around $700, this would be a very nice choice to support your growing wine collection.